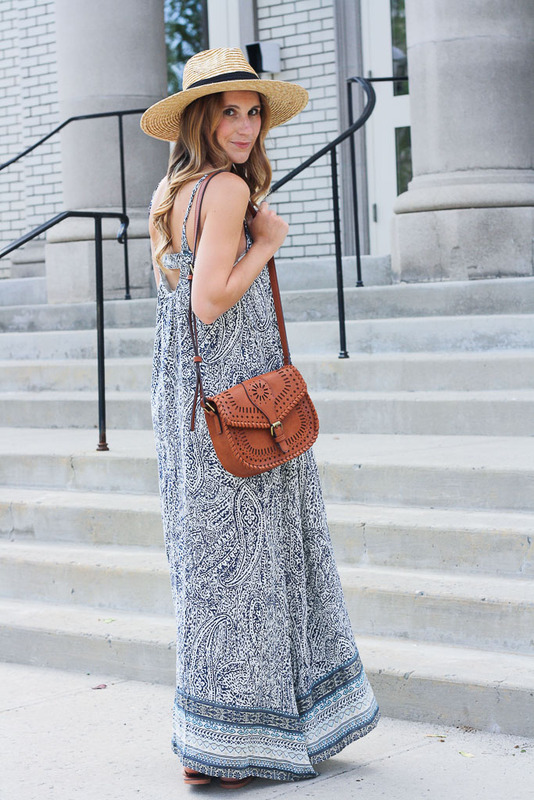 Today’s post is in collaboration with Nordstrom, but all opinions are my own! Thank you for supporting the brands that support Twenties Girl Style! When it comes to makeup, I’m a pretty simple girl. I like an every day face, topped with a little glow and a neutral lip. However, as simple as I am, I do love my makeup products and am always looking for the latest and greatest! I especially love show stopping products that are easy to apply but make me feel like a million bucks! I was so excited to discover the Karl Lagerfeld and Model and Co. Beauty collaboration exclusively at Nordstrom. 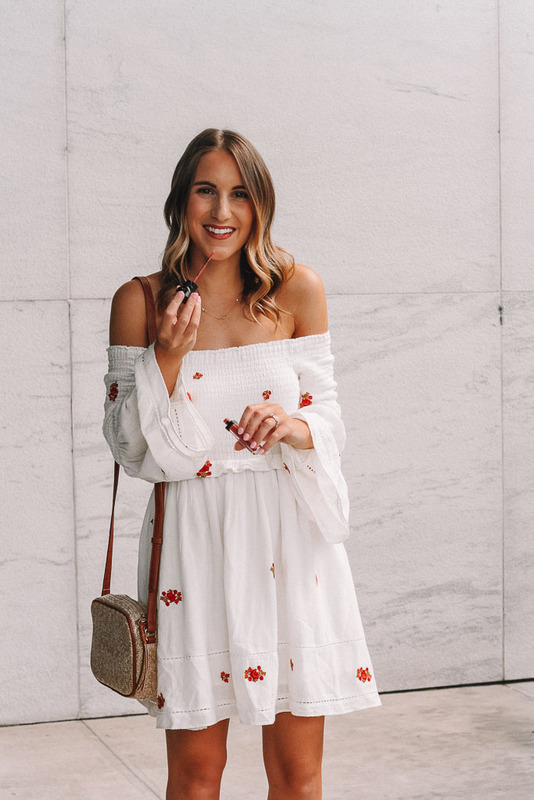 Nordstrom is always my go to for all things fashion and beauty and I have been loving all of the collaborations they have been showcasing lately! The Karl Lagerfeld and Model and Co. Beauty collab is no exception. This high-quality line is full of trend-setting, luxe products, but at price points that are still attainable for the everyday girl. Hello…that’s me! I’ve been looking for a few new summer lip colors, and was immediately drawn to the light up lippies from the new collection. These limited edition products really impressed me and I have officially found my summer lips! My favorite? The Light Up Lipstick. This lipstick is super comfortable, goes on smoothly, dries matte and STAYS PUT. I’ve been loving the soft neutral with a pop Merengue color and have been so impressed with how long lasting it is. This is the perfect lippie to put on while enjoying a summer bbq or drinks with friends. The best part though? When you unscrew the cap, you are in for a surprise as this lipstick features a built in LED light and a mirror, making application easy-peasy. 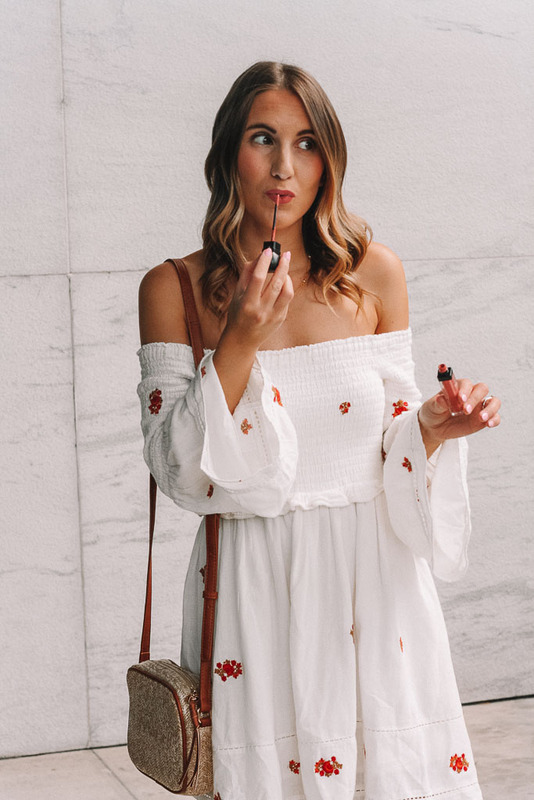 If you are more of a lipgloss kind of gal (who doesn’t love a good gloss? ), the Lip Lights Lip Gloss is high-shine and comes in 8 gorgeous colors. Be sure to check out the Karl Lagerfeld and Model and Co. Beauty collaboration at Nordstrom before these items sell out! This is one collab you don’t want to miss!! The countdown to summer break has officially begun! We are almost in the teens, guys! This teacher is excited for a relaxing summer with days at the lake, especially after a hectic summer of wedding planning last year! The weather has been a little iffy lately, going from 80’s to 60’s and back again, making the daily process of getting ready a little difficult, but I’ve pulled out my summer staples and they aren’t going anywhere until September! 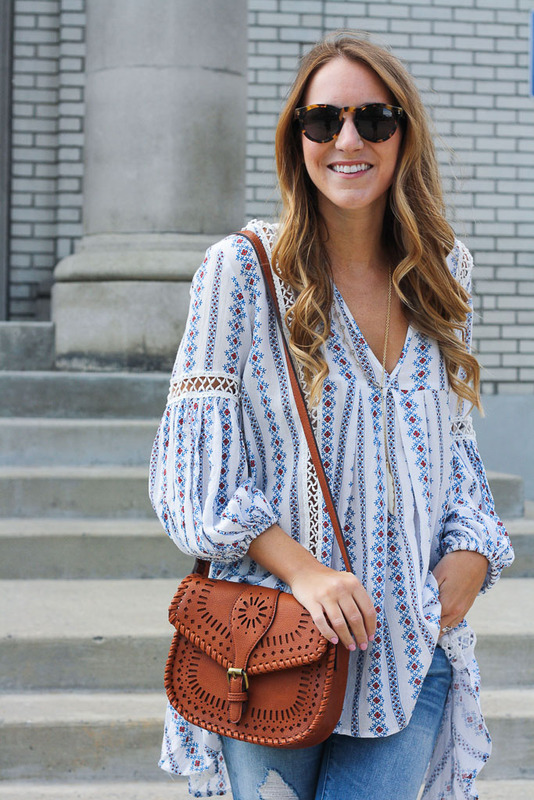 This top from HER Boutique is definitely going to be a repeat offender this summer! 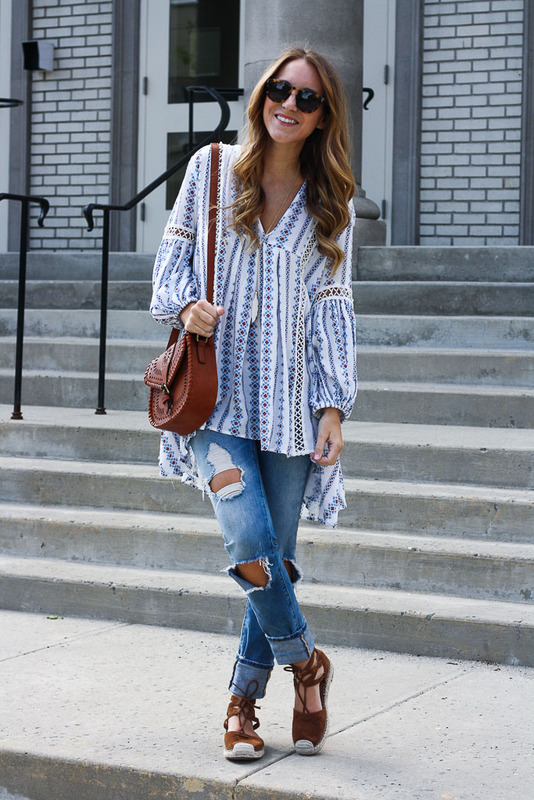 I am obsessed with the off the shoulder style, the fun print and the tassel ties…3 of my favorite things all mixed into one! 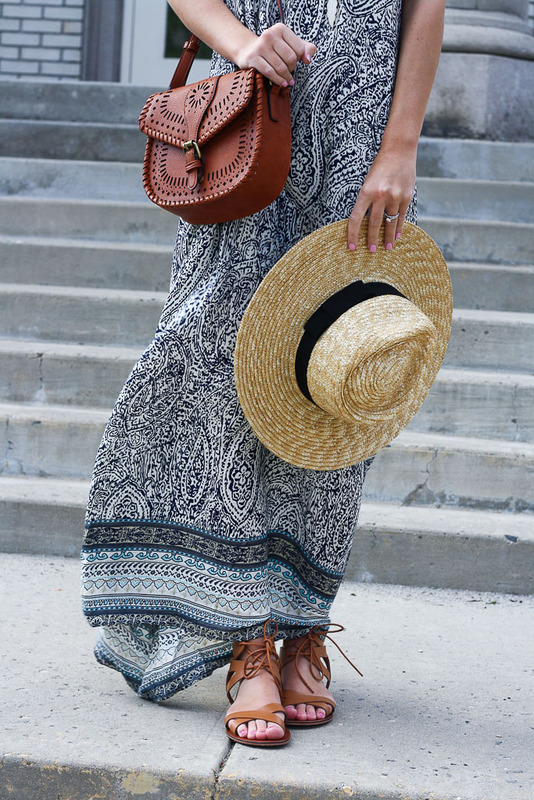 Paired with some cutoff shorts and a pair of gladiator sandals, this is a look that screams easy, breezy summertime! 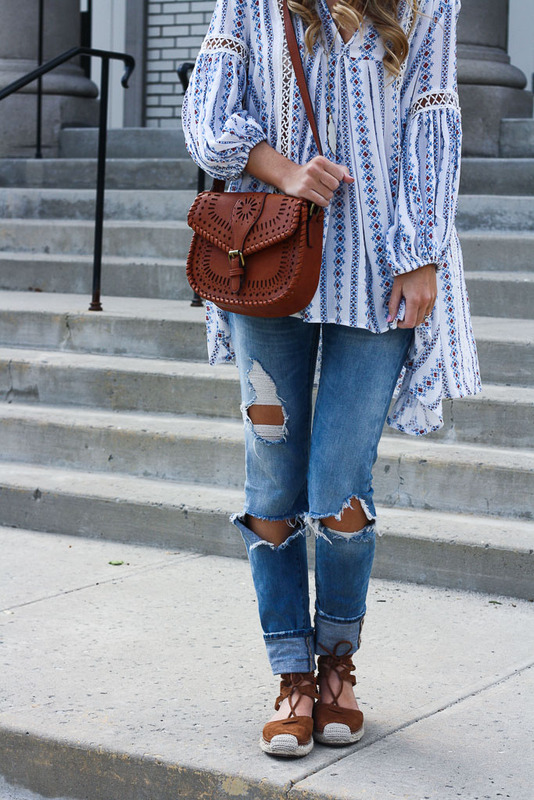 If you follow me on Instagram (@twentiesgirlstyle), you know I’ve been pretty obsessed with this sweet top! 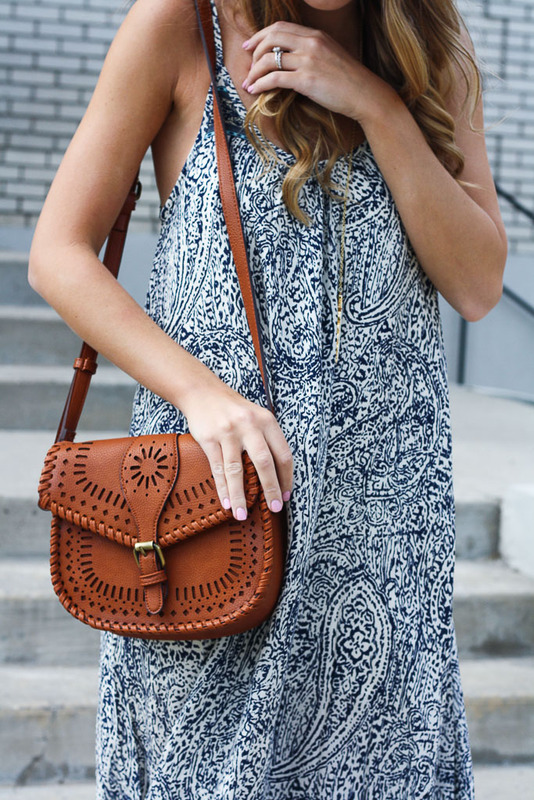 I absolutely love the fit, print and detailing on this top! 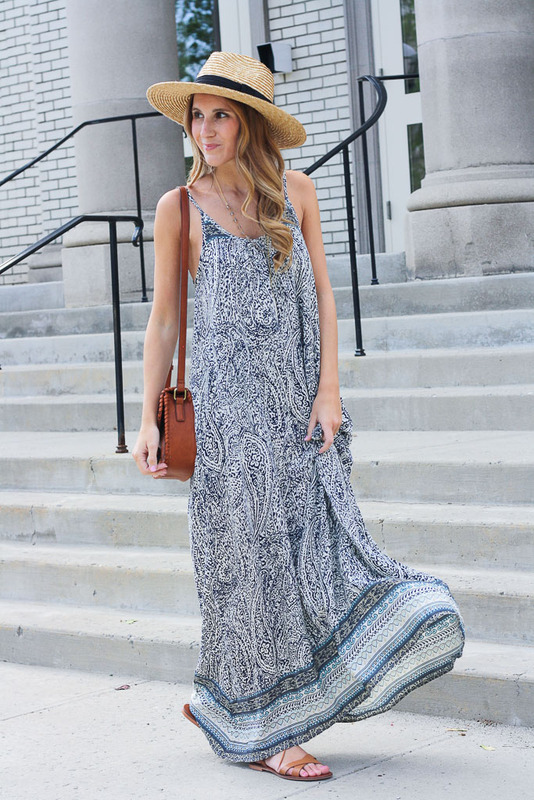 It looks great paired with jeans, shorts or even white pants. I am always looking for tops that can be styled simply (minimal jewelry) and completely make the look. 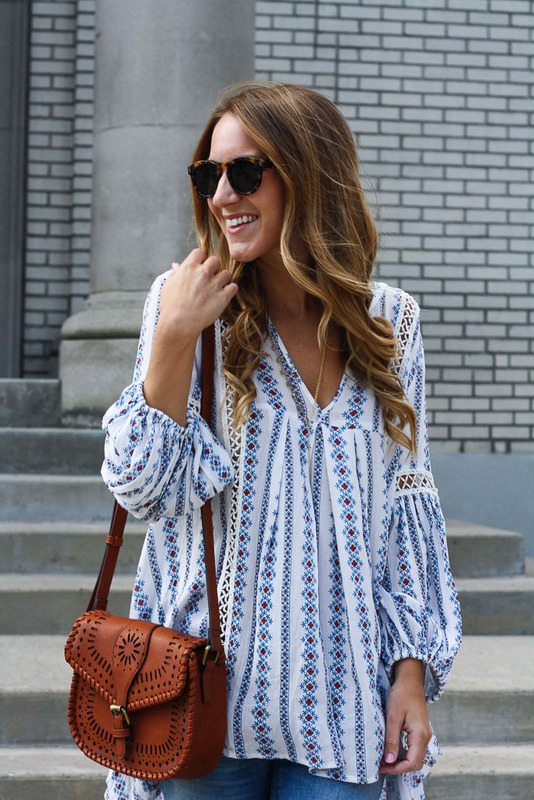 This printed tunic definitely does the job! 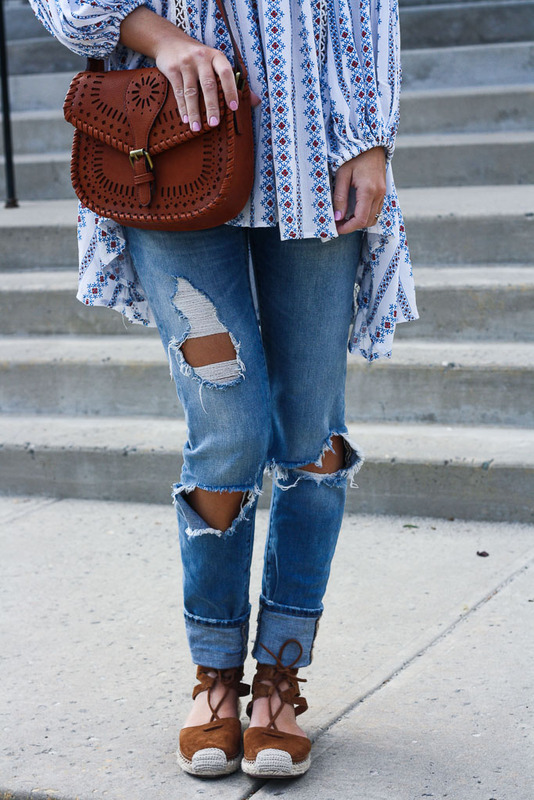 I paired it with distressed denim, espadrilles and my favorite necklace for a casual boho look!